Western Farm Sales is a dealer for some of the top names in the industry and has everything you need to keep your operation running smooth. Check out our brochures below for full product details. If you are having difficulty finding something, please give us a call toll free at 800-635-3293. 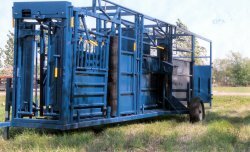 Left Hand Portable Cattle Chute - Can be made to your specifications. Call us for details at 1-800-635-3293. Comes in Brown, Blue, or Red. 38 feet long. 10 foot adjustable alley with scale ready floor. 21 foot Parallel Squeeze System, 2 split tail gates, neck shot door, full floor. Ability to custom make. Please call for pricing at 1-800-635-3293. Please call for pricing and product information.